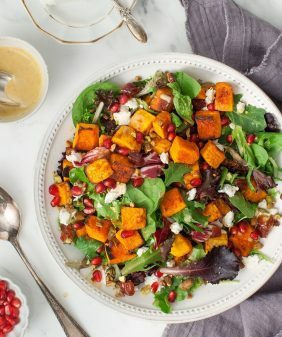 My #1 favorite healthy & hearty fall salad with butternut squash, tart cherries and a savory apple cider sage dressing. Gluten free. My mom loves to clip articles. Newspaper clippings, magazine clippings, stories, recipes – sometimes they come in the mail, sometimes she saves them up for a visit. A couple of years ago she brought me a recipe for a couscous salad clipped from Edible Michiana that was similar to this one. We made it, loved it… then later I lost it. But I could never get this sweet & savory flavor combo out of my mind so I’ve been making versions of it ever since. The original recipe used couscous but I used quinoa here because it’s the grain I usually have on hand. I tossed it with roasted butternut squash, feta cheese and dried tart cherries for a sweet & tangy pop of flavor. They perfectly balance the warm, savory flavors that are going on here. While the butternut squash is roasting in the oven, make your dressing. I slightly warm some olive oil and mix in apple cider vinegar, sage, honey and cinnamon. I promise – once you toss the sage in, your kitchen will instantly smell like fall… it’s just so warm and cozy. Cook quinoa - rinse ½ cup quinoa then transfer to a small pot and toast the quinoa for a few minutes (basically until it’s dry again) over medium heat. Add just over 1 cup of water, cover and bring to a boil then reduce to simmer. Simmer for 15 minutes, then turn heat off and let it sit (covered) for 15 more minutes. Check at some point before the end to make sure it’s not burning - if is starting to - stir in a little more water and probably reduce heat. (Note that I usually cook double this amount and save some for later). Set quinoa aside until ready to use. While your quinoa is cooking, roast your butternut squash. (remove the guts of the butternut squash (save the seeds to toast for later if you want). Peel and slice into 1-inch cubes. Toss with a bit of olive oil, salt & pepper and bake for 25-30 minutes or until golden brown, flipping halfway through. In a small saucepan, gently heat olive oil (it has a low smoke point so you don’t want to heat it too much. If you’re concerned about this use grape seed oil instead). Add the sage and stir until fragrant (30 seconds or so - just until the sage is not raw). Turn off heat and add apple cider vinegar, cinnamon, honey, salt & pepper. Assemble all salad ingredients together and toss with as much dressing as you like. Taste and adjust seasonings. recipe inspired by this recipe from Edible Michiana. I just purchased some tart cherry juice concentrate. I think a sparking tart cherry limeade would be delicious. I think brownies with tart cherries on top would be yummy. Mmm, that salad looks amazing — can’t wait to make it! I think tart cherries are delicious in salads, but I would also love to love to incorporate some into cookies. I just saw a recipe for pavlova and I think tart cherry pavlova would be amazing! There’s a couscous recipe from The Kitchn with tart cherries and arugula that I love. It has similar ingredients to yours, but with a different dressing that changes the flavor. Can’t wait to try yours as well! I’m thinking something frozen, like popsicles or sorbet or ice cream would be delicious! I love eating tart cherries plain or I love making them into a jam. I love using tart cherries to make a pie. One of my faves! Might have to do a galette instead this year because that’s been my thing of late. 🙂 Thanks! This looks wonderful! I think I’d love to come up with a tart cherry crostini of some kind with creamy goat cheese or brie. I think tart cherry pancakes would be delicious! I think tart cherries in a smoothie. I love cherry with herbs– I think sour cherry pie with mint or basil whipped cream would be so good! Or a cocktail with sour cherry and mint and maybe bourbon? Yum! 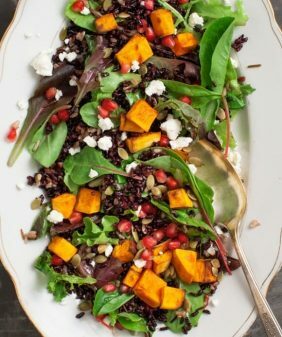 I think a hearty fall salad of seminole (or other humble-type) pumpkin, shallots, tart cherries, leafy greens, and lightly sprouted grains would be delicious and beautifully colorful. 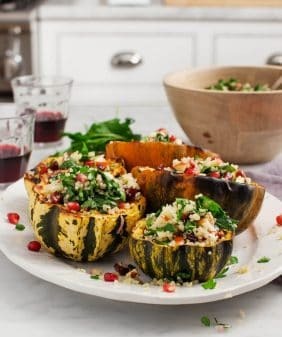 This combination of greens, squash and quinoa looks delicious! I think that creamy polenta with tart cherries and walnuts would be a tasty side dish for a fall meal, or a hearty breakfast. This recipe is beautiful! All the color reminds me of fall. I love sour cherries in a brownie, especially one made with almond meal. we only have a day to pick from our cherry tree before the birds get them. right away i make a pie then freeze the rest of the pitted cherries so at christmas i can make a magnificent black forest cake. thats all we get from our small tree but they are the two best desserts of the year!!! i like this combo! i’m definitely a person who is drawn toward the tart side of things, so these cherries sound fantastic. i would also like to eat them in a sorbet! I would love to make some kind of tart cherry & goat cheese tart (or cashew/macadamia cream for a vegan version)! I think chart cherries would go well in an ice cream/brownie combo. I think tart cherries with string beans in a shallot vinaigrette would be delicious. I love tart cherries!! I am thinking about doing dark chocolate and tart cherry muffins, or tart cherry and walnut brussel sprouts. The possibilities are endless! tart cherry studded roasted apples dusted with cardamom and crushed pistachios with a tart cherry juice infused coconut cream drizzled on top 🙂 Cherries are my favorite, favorite, favorite. I am thinking that Tart Cherries and Chicken breasts baked together would be very good. Like in a reduced sauce. Or even Walnut and tart cherry bread….Or just straight up eating dried tart cherries out of the bag, cause I’m quilty! This sounds sublime!! 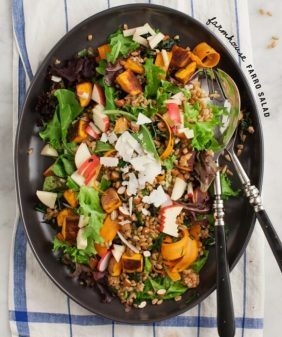 I have been looking for a sweet/savory fall quinoa recipe and this fits the bill! I can’t wait to prepare this with an herbed roasted pork tenderloin. One of my favorite uses for tart Michigan cherries is to add them in with Granny Smith apples in my Apple Puff Pastry Streudel – yum! Sweet and tart! At whole foods the other day they were handing out samples of almond milk ice cream with frozen tart cherry juice on top sprinkled with some chia seeds. It was incredible! Cherry chocolate espresso power/granola bars! Dates, walnuts and/or pecans ohhhhh or pistachios, dried cherries, chunks of chocolate, and a dusting of espresso powder. Yum! How about a tart cherry wine to pair with a nice cherry pie! Ooh, I love this feta, tart dried cherry and butternut squash combo. Who knew those clippings would pay off! Ha ha, my mom does the same thing. She removes pages from cooking mags and sends them in the mail to me. All the way from NH to WA! There have certainly been a few gems in there. This salad looks gorgeous. All my favorite things! Because of the sweet-tart flavour of the tart cherries, it would be really fun to play with sweet-savoury dishes. i think you could make a really tasty tart cherry glaze (with brandy or calvados!) for grilled chicken breasts… Mmmmm I might just have to try that out. I’d love to try making a tart cherry, caramelized onion and gruyere rice flour pizza! Thanks for all of the inspiration! 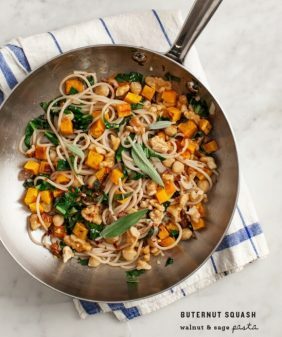 This salad is a great way to quick off the fall season – yum! I make a socca ‘pizza’ topped with arugula, snipped sage, goat cheese, tart cherries and a teeny drizzle of pomegranate molasses. I put tart cherries in my dark chocolate smoothie….mmmmm! I also LOVE putting cherries in my homemade granola! They give it a wonderful tart bite that is great with the nuts and the slightly sweet and salty tastes that you get from honey and sea salt…delish! a tart cherry old fashion – a reinvention of the classic with a kick from the cherries. I think tart cherries and candied walnuts would balance each other. They would be good tossed on julienned string beans. Tart cherries on top of quinoa cooked in coconut milk, topped with pecans and cinnamon. And if it’s a decadent day, shavings of dark chocolate. Yummmm. Reminded me of a tart cherry Collins drink I had in London once-yum! Great salad. I also use cherries in salad and just made a great granola with cherries and apricots. Hubby drinks cherry juice every day to help him avoid gout. He says so far it is working. ..
mmm I’ve done cornbread with cranberries but I feel like tart cherries would add some lovely zest! You should make your grown-up smore’s with dark chocolate and tart cherries! mmmmmm! This salad looks spectacular. I tend to prefer tart over sweet, but I love the interplay here. I recently made a batch of some spicy peach jam and I think some tart cherry pancakes topped with my sweet and spicy jam would be absolutely delicious! Tart cherries go wonderfully with goat cheese. I love to make a goat cheese-based ice cream and include tart cherries. For something healthier, tart cherries go great in a baked oatmeal breakfast. I’ve also soaked cherries in alcohol (rum or vodka) before to use in desserts – learned that from Jeni of Jeni’s Ice Creams! 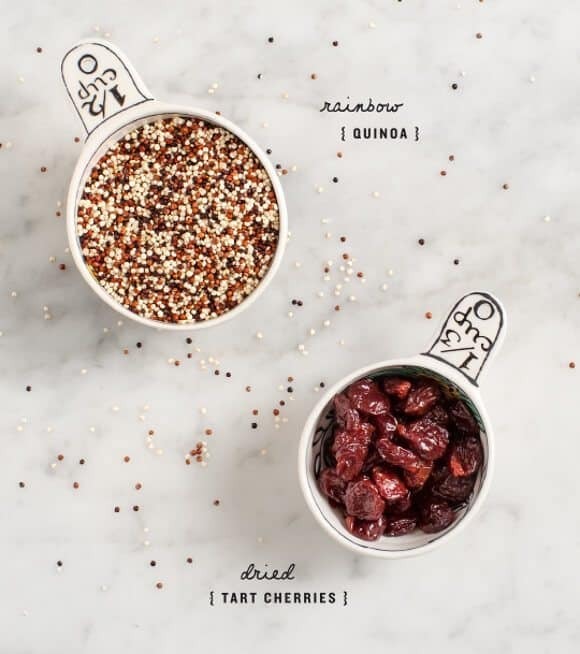 I love quinoa and tart cherries together! I use them to make an oatmeal-like breakfast. Looking forward to trying this recipe. Hm, maybe in addition to roasted butternut squash, some roasted mushrooms. Then the feta and the cherries. And walnuts. And farro. I would make big, flaky scones with tart cherries, chunks of dark chocolate and sprinkle the scones with coarse raw sugar! I’ve been inspired lately by the new How Sweet Eats cookbook where she roasts fresh cherries to top breakfast quinoa. HOLY YUM. I love tart cherries! A good recipe for tart cherries is dark chocolate tart cherry cookies. I have made them a few times and they are divine! Thanks for the giveaway! I’ve recently been enjoying rice dishes having been inspired by my time in South Africa. I would love to try basmati rice, saffron and sour cherries cooked in a little butter, sugar and cherry juice. Served with juicy pork and my favorite South African chutney sauce would be even better! Duh! I forgot my recipe idea. Currently I’m dreaming of a mulled cider or wine featuring tart cherries. Sweet cider paired with tart sweet cherry juice, cinnamon, cloves, maybe some orange and perhaps some bourbon sounds heavenly. I would use tart cherries in a granola bar recipe! My good southern grandma, “Nanny”. Nanny grew up in East Texas, on a big farm, closer to a plantation than to a ranch, but still somewhere in between. She learned to cook from what she called a “hand”, an old Aunt-Jemima-type figure. So even though I am Texan through and through, I have been passed down a little of that soul food mentality from my Nanny’s mentor. God bless her. I remember Nanny’s Tart Cherry Pie and when I saw this post it reminded me of her so fiercely. It was a basic cherry pie but with none if that sickly sweet cherry pie filling. Only dark, tart cherries cooked down in their own juices with dark brown sugar, cinnamon sticks and cloves, then added cornstarch to thicken and threw it in a blind baked crust. Warm, sweet and spicy and just perfect with vanilla Blue Bell on top, melting onto it. You could never get a piece out with out making the whole thing fall apart and making a god awful mess. It was amazing. I’ve experimented with a few changes to spices (bruised black pepper corns, chinese five spice, nutmeg) and fruits (I’ve added poached peaches, black plums, roasted tomatoes) and I’ve been tempted to add a nice spring-y goat cheese. They’ve all been delicious. And nostalgic. tart cherry and chocolate scones would be divine! Anything with tart cherries and almonds is delicious! I might try a scone or muffin sometime soon. What a great giveaway!!! Tart cherry “pesto” with shallots and garlic and olive oil and use it for a sandwich stuffed with leafy greens. The idea is a spin on a recipe I read in a cook book once, although the recipe in the book was with prunes, I think cherries would work well. Cannot wait to make this! Since squash sizes vary so much, could you please give us a general idea of how many cups of cubed squash we should have? Thanks so much! good point – about 2 cups, (like I mentioned, mine was small). I just updated the recipe. One of my favorite desserts is tart cherry pie- YUM! But tart cherries are also so delicious in a creamy smoothie with cocoa powder and a drop of almond extract…. decisions, decisions! I love cherries in baked goods! I found an absolutely amazing cherry-pistachio croissant in a wood-fired bakery (two hours away; aww), and then at home the local baker enlightened me to how delicious berry-stuffed challah is. Put two and two together (since I can’t seem to make laminated dough worth its butter) – and it seems like I’ll be attempting pistachio-dusted cherry challah soon. I use dried tart cherries in homemade granola bars using mini chocolate chips, oats, honey and organic chocolate crisp rice cereal. That salad looks fantastic! I think tart cherries would be great in some granola! Hmmm…I m wondering if roasted brussels sprouts with bacon, tart cherries and balsamic vinegar would be something good? Or another thought – my dad’s favorite pie is cherry-cream cheese icebox pie, made from cherry pie filling. I bet replacing the canned filling with a homemade one from tart cherries would be awesome, and then flavoring the whipped cream with some of the juice…looks like I better get busy! Tart Cherry Dark Chocolate Chip Cookies with Walnuts! I love this recipe! I am a breakfast person so if I had tart cherries I would add them into some delicious muffins or use them as a warm oatmeal topping…. yum! I might even throw them together with some other fruit to use as a syrupy dressing on top of pancakes or waffles. Cake. Scratch that. A homemade pop tart. Basically my childhood staple food. Just picked up two giant butternut squash at the farmers market! Can’t wait to make this. I love the butternut squash & tart cherry flavor combination! Plus with honey and sage and feta?! Amazing. I think tart cherries would be delicious in some dark chocolate brownies with some red wine thrown into the mix. I recently made something similar in a cookie form (http://www.justjfaye.com/2014/09/02/fruit-and-nut-chocolate-zinfandel-cookies/) You can just never go wrong with chocolate, wine, and fruit! I think tart cherries stuffed into a pork loin with onions and garlic and sage would be amazing with a demi glade pan sauce with cherries too…maybe some feta? I would love to make a tart cherry cinnamon granola. I’m definitely going to try your vinaigrette tonight. Never thought of putting sage in there…and because the oil is warm mmmmm, I can imagine the aroma – it’s going to be wonderful. Looks delicious! I’ve been meaning to try a tart cherry salsa. Maybe with red onions, chiles, cilantro, and lime juice? Tart cherries and cherry juice in raw rolled oat smoothie with almond extract, honey and few other items is a neat morning change. Or try the cherries in a yogurt raw oat no cook oatmeal. I used to make a recipe just like this, but with raisins, a bit of orange juice, chickpeas, and cashews; essentially the same recipe, just a few substitutes. But, I lost it years ago and have been trying to find something like it ever since. I can’t wait to throw this one together, now that it’s getting a bit chillier. The first thing that came to my mind when I thought tart cherries was a sangria. But, if we’re talking baking, I’d probably make little cherry hand pies or mini galettes. I tried cherries again this summer after swearing I didn’t like them as a child. I honestly kicked myself for not trying them again sooner! LOVED them. So much I got a stomach ache from attempting to eat my weight in them. After I got over that they were amazing in my overnight oats with dark chocolate and peanut butter. YUMM!!! Chocolate cake with a warm tart cherry sauce. With reasonably nutritious, some people appetites! Thanks for the chance to win! I would do a tart cherry chocolate bread or tart cherries in a fesh kale salad with a grainy wild rice and dressing made from grapefruit, lemon, line and orange! Yum so fresh and healthy!! Tart cherry waffles with mascarpone glaze and a lemon-sugar drizzle! I think tart cherry cheesecake would be delicious! A chocolate and tart cherry milkshake! I think tart chrries would be excellent in cornbread stuffing for Thanksgiving. Maybe with apples, walnuts or pecans, and onions in the mix as well. My MIL would also send or save clippings for me and I came to look forward to them. Tart cherries, just in time for an Autumn dinner of pork loin with garlic and rosemary accompanied with a sauce of tart cherries ! This has been a favorite for us. I also have a recipe for biscotti with dried cherries and white chocolate that I have wanted to try. I am getting hungry by reading others’ suggestions! One of my favourite quick treats – toasted English muffins slathered with brie with tart cherry bits and toasted walnuts, sometimes with a light sprinkle of coconut sugar. I think I’d like to try making roasted sweet potatoes topped with goat cheese and tart cherries and sage. I’m thinking some type of sauce for meringues. I would make a tart cherry and lime sorbet with a little basil for an herbal kick. Or I might pickle the cherries with vanilla, peppercorn, and star anise to use in cocktails or on charcuterie plates! I love all your quinoa salad recipes! So healthy and easy to make. My favorite thing I’ve made with tart cherries was a cherry & goat cheese galette, although those were fresh cherries of course. For the dried ones I’d probably do something like a tart cherry & pistachio scone. There are a lot of good ideas for recipes in these comments! Way to go! Love your blog, btw. Great ideas! Super yummy recipe!!! I make something similar to your beautiful recipe and use it as a stuffing for all differerent kinds of squash. I saw a River Cottage yesterday, and a lovely fresh cranberry focaccia was made. I think subbing in tart cherries would be amazing!!!! I have the best memories of my grandmother making tart cherry pie during the cherry festival in northern Michigan. Cherries found their way into everything. I think a dreamy concoction would include the best products of summer: cherry, peach and rosemary cobbler served warm in ramekins. Or leave out the rosemary and top with honey lavender ice cream! I don’t have much experience working with tart cherries, but here’s an idea: Tart cherries with dark chocolate and almonds in a base of vanilla bean ice-cream! My idea for a recipe including tart cherries are scones made with chia seeds and tart cherries. Loving the idea of a tart cherry and vanilla ice cream, with nice gooey swirls of cherry. salad sounds good. might try it with sweet potatoes too. I love tart cherries and pecans in my morning oatmeal, yummy! Tart cherries and anything chocolate. Black Forest Cake! I would love to try a tart cherry salsa! Dried tart cherries are awesome in homemade granola! I would put tart cherries on top of brie and bake it! And then enjoy with a glass of wine. I LOVE thinking about how to incorporate cherries (and other dried fruits) in SAVORY dishes! I’ve had a Moroccan Beef recipe that calls for raisins that I bet would be wonderful with tart cherries! i like tart cherries in salads along with roasted pecans, a nice goat cheese, and a sweet balsamic vinaigrette. i’m going to try out your recipe! I’ve been starting to get that fall craving for apple pie … an big apple pie with tart cherries and a crumble topping could be a lovely variation! My mom’s tart cherry crisp (warm!) with vanilla bean ice cream is always my favorite treat in the fall! on a smoothie kick right now and I think a tart cherry one with coconut milk would be divine. I love dark chocolate bark with tart cherries and pistachios around the holidays. I would like to put tart cherries in homemade granola bars or in oatmeal. I would definitely bake them into some chocolate chip cookies sprinkled with a little sea salt! Tart cherry pie is the best–from scratch non of that awful cherry pie filling from a can. Also tart cherries are delicious in oatmeal cookies and wonderful paired with chocolate. I love to add them into my granola. It’s sour taste offsets the other dried fruits and honey I use, and adds a fantastic texture and fragrance! Tart Cherry Crumble Pie Bars would be a awesome recipe to make. Love my sweets. Seared crispy skinned chicken breasts with a tart cherry and shallot sauce. I’d stick the cherries into a pot with equal parts sugar and water and simmer all together to make a simple syrup. Cool a bit, whizz in blender, strain. Voila! A tart cherry syrup to mix with champagne or prosecco, or the very best is making a gin and tonic with a couple spoonfuls of syrup to flavor. Mmmmm! I would make a tart cherry sauce cooked in port, orange juice and sage to go over a beautifully cooked pork tenderloin roast. I would make tart cherry and orange zest scones! Would it be weird to add the tart cherry juice to a hummus? Sweet and savory maybe? mmm now I’m hungry. My recipe idea is to use tart cherries in a stuffing for a thick pork chop or pork loin. Apples, walnuts, tart cherries, a little bread, maybe some sharp cheddar or other type of zippy cheese, and lots of yummy herbs would make a delicious stuffing for pork. 🙂 Yay fall!!! This sounds like the absolutely perfect recipe for fall. 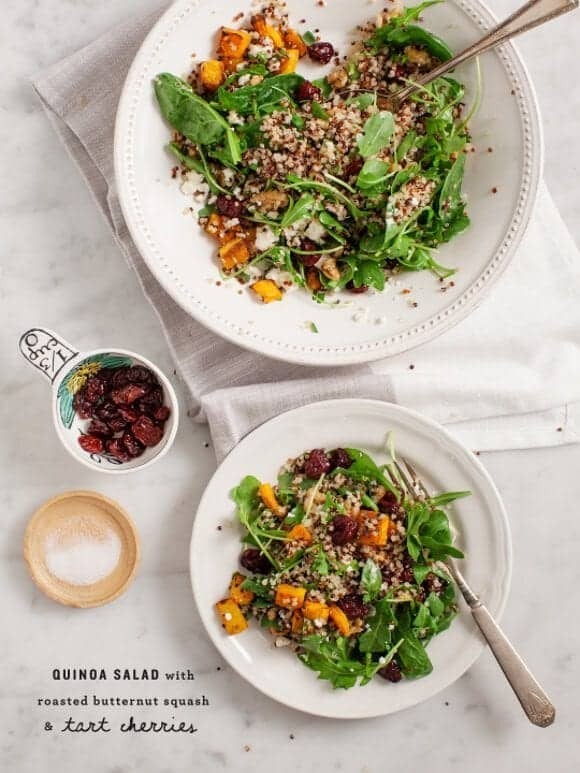 My husband and I have just recently begun cooking with quinoa and LOVE it! We are also both partial to butternut squash and cherries, so I’m sure we will look forward to cooking and enjoying this meal together. I’ve seen some great-looking/sounding recipes for bready-things: a cheese and tart cherry pastry (like a big Danish), and a rosemary and tart cherry focaccia. yum! I think a chocolate chia seed pudding with tart cherries sounds like a yummy recipe idea. I would love to make a tart cherry mint tea for a drink. I was thinking about tart cherries and chocolate in the form of a brownie! Tart cherry and almond oatmeal – a match made in heaven! Reduce tart cherries with sugar and water to make a tart cherry syrup. Combine with good bourbon, a splash of soda and lots of ice. Top it off with a bourbon macerated tart cherry for garnish. I haven’t tried tart cherries yet, but I think they would be great in muffins! Wow! There are some great idea combos and flavors here! I so enjoy reading everyone’s comments. As a child, when my mom would make cherry pie, I thought it was gross. I thought cherries were gross. It might have been a texture thing, who knows?! I didn’t like cooked cherries, go figure.. But as an adult, tart cherries are now one of my favorites! Warm tart cherry lattice tarts with creme fraiche gelato or even a simple brown sugar and oats cherry crisp is one of my favorite baked early autumn delights! I love the gooeyness of the baked tart cherries and their bust of tart juiciness as they pop on my palette! I also think a tart cherry, acai, blueberry, honey, cinnamon and greek yogurt smoothie would be delicious as well! Or mascerated tart cherry with earl grey iced tea. Mmm, so many possibilities! Thanks for the inspiration Jeanine! I will be baking a special tart cherry treat for company this weekend! I love making a big batch of baked oatmeal and freezing individual portions for a fast filling breakfast. I think a tart cherry version would be delicious! This has inspired me! I am dreaming up a salad of shredded Brussels sprouts, chopped kale, tart cherries, toasted slivered almonds, a nutty super age cheese crumbled on top or Comte, and tossed in a tahini, maple and tart cherry juice dressing. My favorite way to use tart cherries is to cook them with rice, saffron, and pistachios. So good! When tart cherries are in season they are such a treat. I think it’s my favorite time of all summer. In my opinion, the best way is to eat tart cherries raw. But if I had a choice to cook something with this main ingredient, tart cherry clafoutis would be my pick. Whole grain cherry pecan muffins sound great for a breakfast treat! Drizzled with some nut butter and maybe extra fresh ones on the side! Tart cherries go really well with breakfast quinoa — quinoa cooked in (coconut) milk, topped with nuts and cherries! I could really go for a tart cherry homemade pop tarts with brown butter frosting. Yum! tart cherry ice cream! maybe with some hot fudge on top. Dried tart cherry chocolate chunk cookies: tart chewy cherries are a perfect foil for decadent chocolate chunks, all enrobed in rich chocolate cookie dough. Tart cherries soaked in port, finish in pan with seared duck with a sprinkle of fresh thyme. I once tried to make my own cherry vodka, my brother loved it…me, not so much. My usual cherry recipe is cherries with some good cheese, but now that I think about it brie baked with cherries would probably be tasty. I love tart cherries (especially early into fall). One of my favorite recipes is a smoothie I make with tart cherries, black cherries, 1 frozen banana, 2/3 Cup Coconut Milk, 1/4 Water, and a drizzle of honey. Blend and serve, it’s like a milkshake but healthy and a bit tartly. Tart cherries with spinach linguine! Sauté spinach with tart cherries olive oil and garlic; toss with ground pepitas, salt, pepper and linguine! So tasty! A tart cherry flatbread, with plenty of roasted garlic, goat cheese (or bleu cheese if you’re feeling adventurous), arugula, and some herbs (tarragon or rosemary would work well I think) . Frozen tart cherries + cottage cheese + almond-coconut milk + chocolate whey protein powder = heaven! Tart cherries in a wild rice salad or wild rice hot dish would be delicious! Thank you for the giveaway! I love your blog! I would make a tart cherry chutney. I would make it really spicy and savory with lots of warm spices, like cinnamon, cardamom, red pepper flakes and fresh ginger. And, I would make it really chunky and marmalade-y. Then I would use it on everything – grilled cheese, tacos and all kinds of squash! I love the idea of tart cherries with a savory dish! I think tart cherries with roasted cumin-y cauliflower would be super interesting. I’d love to make a warm tart cherry compote/sauce to serve over vanilla ice cream! 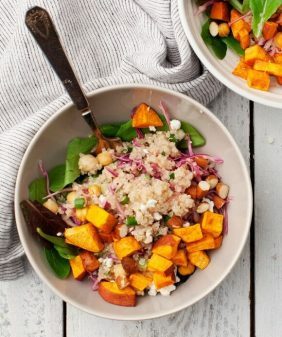 Quinoa and butternut squash are a few of my favorite things! Love! Hmmm… Oatmeal with dried sour cherries, a handful of walnuts, and a bit of maple syrup is the perfect weekday breakfast! And I’ve made cinnamon-raisin buns with cherries instead of raisins – good times. Also, just eat the things by the handful, ideally with a piece of chocolate as a chaser. Love this!! Tart cherries are amazing for joint pain also! Im obsessed with chocolate so maybe dark chocolate tart cherry brownies! The way you used the cherries in this recipe reminded me of sun-dried tomatoes. I love pasta, but sometimes it can be a bit heavy…so I often go towards soba noodles as the lighter alternative. I would love to see how the cherries would develop in a light, savory tomato sauce spooned over soba noodles. Maybe a bit of fresh arugula and sauteed mushrooms to top it all off. Tart cherry chutney served over warmed Brie with slices of baguette! My mother and I make amaaaaaaazing oatmeal cookies with dried tart cherries, dark chocolate chips, dried apricots, a hint of cinnamon and walnuts. They have the perfect amount of sweetness, and the oatmeal actually keeps you filled up! A fun (and slightly naughty) alternative to a morning granola bar. I think sour cherry and orange compote with some Greek yoghurt on top would be a nice fall breakfast, but I also love saffron pilaf with chicken and dried sour cherries. I love putting cherries in my homemade kombucha, mixing them into muffins, or tossing them on salads with goat cheese and sweet potatoes! Sour cherry jam and Gruyere grilled cheese on sourdough bread made with good Irish butter. So simple.. still, there’s nothing so good as a burst of sour cherry tucked into a batch of classic oatmeal chocolate chip cookies! Perfect for the early days of fall. Dark chocolate brownies with port soaked sour cherries. Spread a warm pear and tart cherry compote over honey chevre on home-baked bread. Breakfast quinoa “oatmeal” with tart cherries!